and The Recognized Expert in Your Space. View the AHAthat Business Model. Want to see if this makes sense for you? Author of the book “Leverging NetSuite & Your Mobile Device to Make More $$$” speaks about the ease of creating a book for thought leadership and the ability to close clients with it. Josh Jones, author of the book “Don’t Knock It Till You Knock It” speaks about the benefit of writing a book and using it as a tool to expand your business and to market yourself, and your product. Author of the book “Maximize Your Leadership Influence” Laura Sicola gives a testimonial on going through the ghostwriting Interview with AHAthat. Don’t have the time to write your book? Click here where we interview you and ghostwrite the book for you! 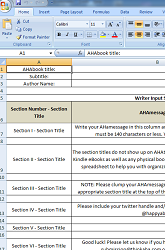 Writing an AHAbook is easy as 1-2-3! Want to write your own book? View the AHAthat Business Model. Enroll to our AHAthat Writing School to get access to our AHAthat writing process. 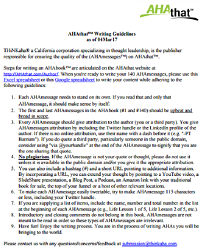 Step 1: Share ideas so we can create the AHAbook cover. Let us know what color, images you want to have on your cover. If you need to search for images, please go to https://depositphotos.com, https://pixabay.com, and https://www.pexels.com; and let us know if you have an image you would like to use. => If you prefer to create your own cover, click here for the specifications. Step 2: Submit your headshot (NOTE: min size: 1000x1000px). Step 3: Review, edit and approve the copyedited AHAmessages, metadata & cover. 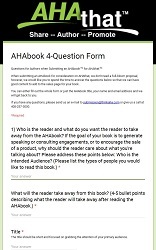 Step 1: Click the http://aha.pub/MarketingChecklist to see our DIY marketing checklist of things you can do to market your AHAbook. Step 2: AHAthat will provide you an AHAkey that you can use to automatically share your entire AHAbook on twitter. #Powerful. Go to https://AHAthat.com/AHAblaster and click on the “?” to watch this video https://youtu.be/2tDVuh3vI0k to learn more. 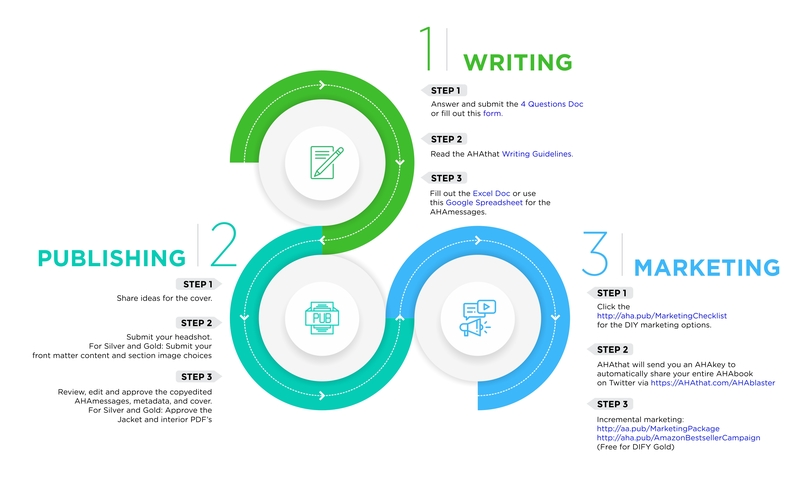 Step 3: For those wanting more help, AHAthat has a marketing package for you: https://www.AHAthat.com/Marketing. We can also help you become an Amazon Bestseller: http://aha.pub/AmazonBestsellerCampaign. Touch your prospects visually and kinesthetically with video summaries of your book sections: https://AHAthat.com/CreateBookVideos. Let your audience hear your thought leadership: https://AHAthatradio.com. Testimonials on why it makes sense to use AHAthat from Diane Updyke, Nick Cioffi, Marjorie Saulson, Bill Wallace, Nick Temple. Author of the book “Turning Japanese Execs Into Effective Global Leaders” how fast and easy the interview and writing/publishing process at AHAthat is. Testimonials on why it makes sense to use AHAthat from Ted Rubin, Carly Thorne, Daniel Gutierrez, Jorge Zavala, Mike Agron, Steve Peterson, and Lori Ruff.